Dear every Family, How are you? This is BOF. We let you know that the article regarding Mr. BYJ's cosmetics business, as reported on past 6, is not true. The particular article has been deleted after contating the media, and we got to talk to you one more time with this public notice because there might be people who misunderstand if that business is actually progressing among Family who read the article. At present, Mr. BYJ is deeply occupied with preparation for acting in 'WLS' animation and drama 'Dream High', along with preparation for a book he is to publish. We would like to ask your deep understanding for confusing you, Family, with the groundless article, and we will put an effort to be able to greet you with good news in the future. As it became much warm, we wish you to have balmy and refreshing Spring season. 매니지먼트 기업 BOF가 끼 있고 열정 넘치는 신인 배우를 선발합니다. 미래의 대한민국 대표 배우가 될 당당한 기량과 열정의 도전자를 기다립니다. ※ 오디션 신청은 정해진 형식에 따라 사진 및 자기소개서를 작성해 주시기 바랍니다. We hope every family member has a great summer with continuous small pleasure. members know the correct details because there have been many inquiries. ‘the Beauty of Korea (title subject to change)’. Thank you for your sincere interest in BYJ’s every activity and in the event. 한낮의 더위가 가라앉고 가을바람이 마음을 평온하게 하는 요즘입니다. 이 가을 가족 분들께 반가운 소식을 전해 드립니다. 1년 여 간의 작업 끝에 배용준씨의 <한국의 아름다움을 찾아 떠난 여행>이 오는 9월 23일 발간을 앞두고 있는데요. 이에 앞서 인터넷 서점을 통해 사전 예약판매를 시작합니다. 아래 자세한 내용을 참조하시길 바랍니다. 항상 따뜻한 성원 보내주시는 가족 분들께 진심으로 감사 드리며 모두 풍성한 가을 보내시기 바랍니다. 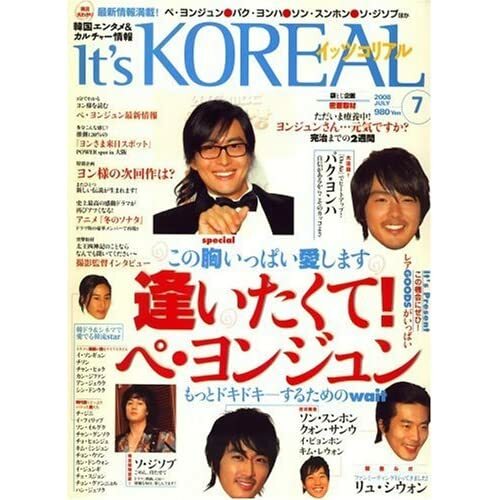 Bae Yong Joon will soon be making his official visit to Japan. In accordance with his Japan visit, we have a request to the family. parties, we ask you not to greet him at the airport. We appreciate your understanding, and we ask you for your continuing support. 갑작스러운 배용준씨의 입원 소식으로 많은 가족 분들께서 걱정하고 계실 줄로 압니다. 서 최선을 다해 돕도록 하겠습니다. 要為健康著想吧﹗ 你 ! 你 ! 花版大! Because there is a news that is waiting for warm interests from many people in cold winter, we deliver it in this Public Notice. The news is exactly that Mr. BYJ participated in UN Climatic Agreement 'Seal the Deal' Campaign by narrating its public service video. The 'Seal the Deal' Campaign is the one to urge people all over the world to have interests in climatic changes prior to the Climatic Agreement General Assembly to be held in Copenhagen, Denmark in coming December. We would like you to feel in the video Mr. BYJ's heart-felt voice, informing the seriousness of the climatic changes and appealing the importance of green growth. You can check the video, made public in Naver Happy Bin on the 25th, also in the link below. We beg many people warm interests as it is a profoundly significant campain with which Mr. BYJ also deeply symphasized. We wish you to have happy year end with precious people during a little remaining year 2009. 니다. 우선 가족 여러분들을 놀라게 해드린 점 진심으로 죄송하게 생각합니다. 게도 가족분들이 부상을 입는 일이 발생하였습니다. 히 이송하였고, 다행히 빠른 치료를 받을 수 있었습니다. 원에 찾아가 머리 숙여 깊은 유감을 표하며 빠른 쾌유와 진심 어린 사과의 말을 직접 전했습니다. 든 분들이 완쾌할 수 있도록 끝까지 최선을 다하겠습니다. 가족분들이 걱정하는 일 없도록 사후 조치에 만전을 다할 것을 약속 드립니다. 다. 모쪼록 모두 큰 피해가 아니길 진심으로 바랍니다. 앞으로 더 좋은 소식 전해드릴 수 있도록 더욱 노력하겠습니다. 다시 한번 가족분들에게 걱정을 끼쳐드린 점 진심으로 사과의 말씀 드립니다. 听說你玉體違和, 好了嗎 - 溫馨的問候 . Get well soon, BYJ ! 讚! We can see 老大 and the Dream High cast again !